Technology has come a long way, from those bulky computers to nifty mobile applications for personal use. Us, millennials, have learnt to leverage on technology to make life easier. Some of us have even moved on to creating those software and mobile applications to help others, addressing unique pain points that our grandparents have never had, or even heard of. As a fellow millennial, I have tried many of these apps out there. Some were amazing, and some did not work so well for me. So below is a list of five productivity tools that I thought were crazily useful and perhaps, are ones that you never knew you need. With so many communications application, I constantly find myself having to open multiple windows as I jump from one messaging platform to another: Whatsapp for school work, Telegram for internship, Facebook Messenger, Line and WeChat for personal use. It was really troublesome and I really wanted something that could consolidate my messaging platforms in a single place. You have no idea how thankful I was when I found Franz. I like its light blue no frills design, with no advertisements and the best part is, it is completely free! It is compatible with most of your favorite communications applications, so it is great both for personal and corporate use. Simply add in which applications you want and you get to manage them all in one place. There are options to cater your notification preferences. Go and try this out, and I can almost guarantee that you will, just like many of my friends that I have introduced Franz to, be loving this desktop application to bits. 2. Workflowy Notebook for lists, to help you organize your thoughts and to-dos. Introduced to me by Stephenie, the co-founder of TalentTribe, I decided to give it a shot, mainly out of curiosity. It certainly helps to know that largely successful startups like Slack and Workflowy themselves used Workflowy in the their product development processes. 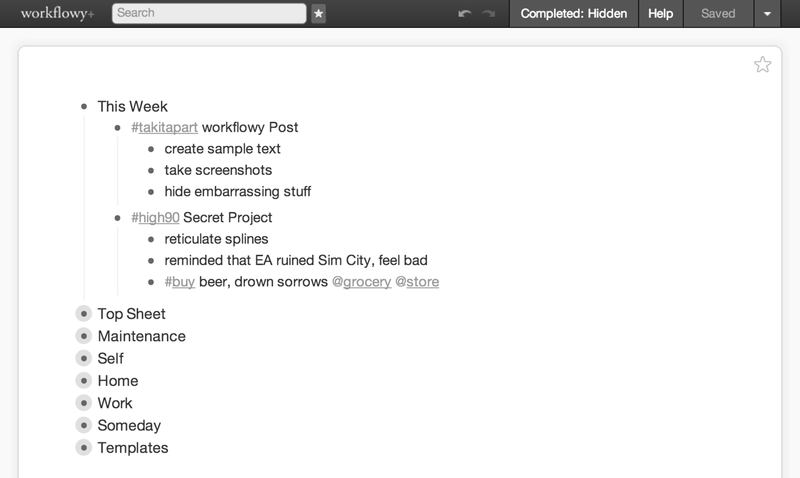 It looked like a regular to-do list application at first glance. You know how each task always require multiple small steps and it becomes difficult to manage these little tasks together? Workflowy solves that exact problem. Under a main task, you could add in as many subtasks as you need to complete that one big task. You can set individual deadlines by adding #today or #this week at the back of the task. To see what the tasks that are due today, search for #today and you will see all tasks tagged with #today at a go. The ability to add subtasks or even subtasks under a single subtask and filtering function are often missing in many of the to-do applications offered in the market. Workflowy is a great tool when you need a platform to track your work, keeping things organized all the way down to the subtasks. 3. Trello Use boards, lists and cards to organize and prioritise your projects and tasks. This is a popular tool amongst enterprises and start-ups, particularly to organize projects and tasks, be it for software development or managing their editorial calendars. It can as applicable for students as well. You can break down your huge project into various cards, set deadlines and assign to your team mates with every individual task. You can include images, save links and share documents with each other easily. The first time I used Trello was during an internship with a start-up and I was amazed with what it can do. It is intuitive and easy-to-use, so even a tech noob like me could pick up in no time. Now, I use it to manage my editorial schedule, so that I have a clear view on what is in progress, which articles are currently being reviewed as well as the due dates. My favorite feature is that I could just drag and drop the cards. So I could drag my article card from ‘In Progress’ to ‘Pending Review’, almost like moving a post-it note. 4. CreativeMarket One-stop marketplace for graphics, templates and fonts – with 6 free goods available for download each week. This is a one stop marketplace for design products like graphics, templates and fonts. There is a great variety there and sometimes even when I have no need for their products, I enjoy scrolling through their offerings, just to replenish my design inspiration and creative juices. But I have yet to get to the best part. Think: Freebies. (Source: CreativeMarket) Having religiously visiting CreativeMarket weekly for the past year, I have amassed a whole inventory of amazing powerpoint presentations, fonts and other design products. It sure comes in handy during school projects, especially when my forte does not lie in designing. This is also a great way for you to find great design products that may be helpful to you, some of the designs are really worth money invested in them! 5. IFTTT If this, then that. Set up workflows to help you automate everyday manual tasks. I love the fact that there are many applications that can help me, from calendars for scheduling to news feed to help me stay updated with current affairs. But it frustrated me that they do not ‘talk’ to each other, meaning they do not interact with each other. Well, most of the time, I have to be the one to manually link them up. What if you could share new posts immediately on Facebook, after posting it on your blog? Or download your Facebook photos, the moment your friends tag you in them? These are one of the many tasks that IFTTT could automate for you. Think of it as a personal bot assistant, taking care of the mundane tasks for you. I use IFTTT to automatically unsilence my phone when I get home, because I always forget to do that and end up missing all kinds of notifications. As well as send me a reminder when it is predicted to rain by the weather forecasts. This saves little pockets of time that could be pretty significant in totality. Five tools I have personally used and found them to be really useful. If you do know of any other useful productivity tools you’d definitely recommend (especially if it is free), drop us a note over our Facebook chat! I would love to try them out. Veena is the content creative at TalentTribe. As a fellow millennial, she understands how daunting the job searching process can be and is passionate in helping people discover careers that they will love. She shares insights and tips that she gained from speaking to all factors of the employment equation. Psst! We’re letting you in on the best kept secret gadgets to deal with inefficiency. The tried and tested version.